New breweries are popping up like daisies here in Chicago. Argus Brewery, located deep in the South Side, is one of the latest in town to start selling bottles locally. As someone who is always willing to support area craft beer, I picked up a six pack of one of their flagship offerings: Pegasus IPA. After pouring Pegasus into a pint glass, I was very surprised with its color. This is significantly darker in appearance compared to most American IPAs, as it has a copper-like red look to it. Its aroma is very subdued, with only slight hoppy notes. The taste, however, piles on the hops, and they leave a lingering bitterness reminiscent of grapefruit. Traces of caramel are also present. 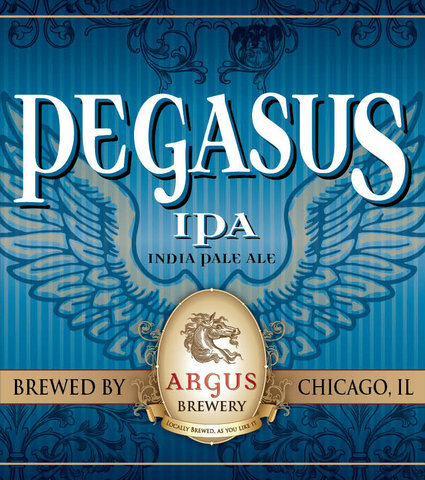 Pegasus IPA is a reasonably drinkable beer with a good ABV kick, but it lacks a special “oomph” to make it stand out from the rest of the pack. I still enjoyed my sampling, but this is not something I will go out of my way to get again. I have to admit that I found it somewhat amusing that the brewery puts a mini-review directly on their labels, though, even going so far as to include an “overall impression”. Thanks, Scott! Any luck with the RSS feeds?